Cartersville, Ga. – Patcraft, a leading provider of performance flooring solutions, has introduced its latest carpet tile collection, Tangible Hue. Inspired by the appeal of creating bright, uplifting spaces, products are infused with color, offering designers, end-users and facility managers a beautiful range of color palettes for impactful commercial design. 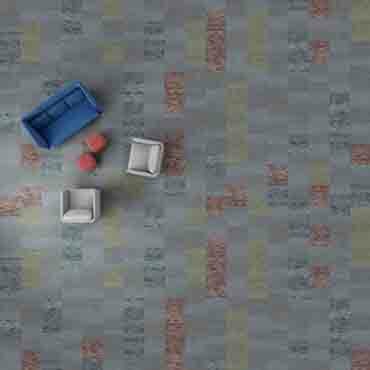 Available in 24” x 24” tiles, patterns combine texture, light and energy to create playful and energetic spaces. Tangible Hue includes three dynamic patterns designed to complement one another in a lively interaction between shape, color and texture. Color offerings include saturated primaries and stable neutral tones that are enriched and uncomplicated, and these sophisticated twists create a complex dimension on the floor. Products are ideal for wayfinding and crossover spaces that create balance and impact with multi-functional outcomes. Constructed with Solution Q Extreme®, Tangible Hue is Cradle to Cradle Certified™ Silver and offers a beautiful design option within high-demand environments. Products are backed with a lifetime warranty against stain, colorfastness to light, static and abrasive wear for maximum performance and appearance retention. The Tangible Hue collection has been thoughtfully designed to energize, inspire, and enliven the world around us.